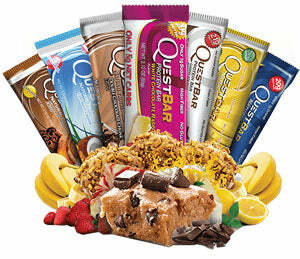 Quest bars have an amazing nutritional profile. They've got 20g of protein, 4g non-fiber carbs, and no sugar alcohols or other junk. If you could eat candy all day and get lean, you probably would. Most likely, you’re just like us here at team Quest; to feel good and look great you have to work hard. And the last thing you want to do is throw that hard work away by eating other nutrition bars or meal replacement bars that are little more than thinly disguised candy. After years of development, Quest has been able to produce the worldís first truly low-carb protein bar that uses only high-quality proteins and no simple carbs of any kinds, no sugar alcohols, and no glycerin – only perfect nutritional ingredients. INGREDIENTS:Protein Blend (Milk Protein Isolate, Whey Protein Isolate), Soluble Corn Fiber (Prebiotic Fiber), Almonds, Water, Erythritol, Natural Flavors, Unsweetened Chocolate, Cocoa Butter. Contains Less Than 2% Of The Following: Cocoa (Processed with Alkali), Coconut Oil, Sea Salt, Sunflower Lecithin, Baking Soda, Xanthan Gum, Steviol Glycosides (Stevia). INGREDIENTS:Protein Blend (Milk Protein Isolate, Whey Protein Isolate), Soluble Corn Fiber (Prebiotic Fiber), Almonds, Water, Erythritol, Natural Flavors, Walnuts, Dried Bananas, Palm Oil, Sea Salt, Calcium Carbonate, Steviol Glycosides (Stevia), Cinnamon. Protein Blend (Milk Protein Isolate, Whey Protein Isolate), Soluble Corn Fiber (Prebiotic Fiber), Almonds, Water, Erythritol, Natural Flavors, Walnuts, Dried Bananas, Palm Oil, Sea Salt, Calcium Carbonate, Steviol Glycosides (Stevia), Cinnamon. INGREDIENTS:Protein Blend (Whey Protein Isolate, Milk Protein Isolate), Isomalto-Oligosaccharides (Prebiotic Fiber), Peanuts, Water, Erythritol, Cocoa. Contains less than 2% of the following: Sea Salt, Steviol Glycosides (Stevia), Lo Han Guo, Natural Flavors. INGREDIENTS:Protein Blend (Milk Protein Isolate, Whey Protein Isolate), Soluble Corn Fiber (Prebiotic Fiber), Almonds, Water, Erythritol, Natural Flavors, Palm Oil, Sea Salt, Cinnamon, Calcium Carbonate, Steviol Glycosides (Stevia). INGREDIENTS:Protein Blend (Milk Protein Isolate, Whey Protein Isolate), Soluble Corn Fiber (Prebiotic Fiber), Almonds, Water, Erythritol, Dried Coconut, Natural Flavors, Cashews, Palm Oil, Sea Salt, Steviol Glycosides (Stevia). INGREDIENTS:Protein Blend (Milk Protein Isolate, Whey Protein Isolate), Soluble Corn Fiber (Prebiotic Fiber), Almonds, Erythritol, Water, Natural Flavors, Palm Oil, Sea Salt, Citric Acid, Steviol Glycosides (Stevia). INGREDIENTS:Protein Blend (Milk Protein Isolate, Whey Protein Isolate), Soluble Corn Fiber (Prebiotic Fiber), Almonds, Water, Erythritol, Natural Flavors, Dried Strawberries, Palm Oil, Sea Salt, Steviol Glycosides (Stevia). INGREDIENTS:Protein Blend (Milk Protein Isolate, Whey Protein Isolate), Soluble Corn Fiber (Prebiotic Fiber), Almonds, Water, Apples, Natural Flavors, Erythritol, Palm Oil, Sea Salt, Cinnamon, Calcium Carbonate, Sucralose, Malic Acid. INGREDIENTS:Protein Blend (Milk Protein Isolate, Whey Protein Isolate), Soluble Corn Fiber, Water, Erythritol, Almonds, Palm Kernel Oil, Natural Flavors. Contains Less Than 2% of the Following: Sodium Caseinate, Sea Salt, Gum Arabic, Spirulina Extract (Color), Turmeric Extract (Color), Radish Extract (Color), Sucralose, Sunflower Lecithin. Contains: Almonds and Milk. Processed in a facility that also processes egg, peanuts, soy, wheat, and other tree nuts. INGREDIENTS:Protein Blend (Milk Protein Isolate, Whey Protein Isolate),Soluble Corn Fiber (Prebiotic Fiber), Almonds, Water, Dried Blueberries, Palm Kernel Oil, Natural Flavors, Cocoa Butter, Sea Salt, Cinnamon, Sucralose, Baking Soda, Cellulose Gum, Xanthan Gum, Steviol Glycosodes (Stevia). INGREDIENTS:Protein Blend (Whey Protein Isolate, Milk Protein Isolate), Isomalto-Oligosaccharides (Prebiotic Fiber), Almonds, Cocoa, Water. Contains less than 2% of the following: Sea Salt, Lo Han Guo, Sucralose, Natural Flavorings. INGREDIENTS:Protein Blend (Milk Protein Isolate, Whey Protein Isolate),Soluble Corn Fiber (Prebiotic Fiber), Almonds, Water, Unsweetened Chocolate, Natural Flavors, Erythritol, Cocoa Butter, Palm Oil, Sea Salt, Calcium Carbonate, Sucralose, Steviol Glycosides (Stevia). INGREDIENTS:Protein Blend (Whey Protein Isolate, Milk Protein Isolate), Isomalto-Oligosaccharides (Prebiotic Fiber), Erythritol, Water, Unsweetened Chocolate, Almonds, Cocoa, Cocoa Butter. Contains less than 2% of the following: Sea Salt, Stevia, Natural Flavors. INGREDIENTS:Protein Blend (Milk Protein Isolate, Whey Protein Isolate), Soluble Corn Fiber, (Prebiotic Fiber), Natural Flavors, Erythritol, Palm Oil, Dextrin, Sea Salt, Sunflower Lecithin, Sucralose, Color (Fruit Juice Turmeric), Coconut Oil, Xanthan Gum, Baking SOda, Peppermint Oil, Steviol Glycosides (Stevia). INGREDIENTS:Protein Blend (Whey Protein Isolate, Milk Protein Isolate), Isomalto-Oligosaccharides (Prebiotic Fiber), Almonds, Water. Contains less than 2% of the following: Freeze Dried Blueberries and Strawberries, Sea Salt, Lo Han Guo, Sucralose. Protein Blend (Whey Protein Isolate, Milk Protein Isolate), Isomalto-Oligosaccharides (Prebiotic Fiber), Almonds, Water. Contains less than 2% of the following: Freeze Dried Blueberries and Strawberries, Sea Salt, Lo Han Guo, Sucralose. INGREDIENTS:Protein Blend (Milk Protein Isolate, Whey Protein Isolate),Soluble Corn Fiber (Prebiotic Fiber), Almonds, Water, Pecans, Gluten Free Oats, Unsweetened Chocolate, Eruthritol, Natural Flavors, Cocoa Butter, Sea Salt, Cinnamon, Sucralose, Steviol Glycosides (Stevia). INGREDIENTS:Protein Blend (Milk Protein Isolate, Whey Protein Isolate), Soluble Corn Fiber (Prebiotic Fiber), Peanuts, Water, Almonds, Natural Flavors, Erythritol, Palm Oil, Sea Salt, Calcium Carbonate, Sucralose, Steviol Glycosides (Stevia). INGREDIENTS:Protein Blend (Whey Protein Isolate, Milk Protein Isolate), Isomalto-Oligosaccharides (100% Natural Prebiotic Fiber), Peanut Butter, Almonds, Water. Contains less than 2% of the following: Sea Salt, Lo Han Guo, Natural Flavors, Sucralose. Protein Blend (Whey Protein Isolate, Milk Protein Isolate), Isomalto-Oligosaccharides (100% Natural Prebiotic Fiber), Peanut Butter, Almonds, Water. Contains less than 2% of the following: Sea Salt, Lo Han Guo, Natural Flavors, Sucralose. INGREDIENTS:Protein Blend (Milk Protein Isolate, Whey Protein Isolate), Soluble Corn Fiber (Prebiotic Fiber), Almonds, Water, Cocoa Butter, Cocoa (Processed with Alkali),Natural Flavors, Erythritol, Sea Salt, Sucralose, Steviol Glycosides (Stevia). INGREDIENTS:Protein Blend (Milk Protein Isolate, Whey Protein Isolate), Soluble Corn Fiber, Almonds, Erythritol, Water, Unsweetened Chocolate, Natural Flavors, Cocoa Butter. Contains less than 2% of the following: Cinnamon, Sea Salt, Baking Soda, Palm Oil, Steviol Glycosides (Stevia), Sunflower Lecithin, Surcalose, Cellulose Gum, Xanthan Gum. INGREDIENTS:Protein Blend (Whey Protein Isolate, Milk Protein Isolate), Isomalto-Oligosaccharides (Prebiotic Fiber), Almonds, Water. Contains less then 2% of the following: Sea Salt, Lo Han Guo, Natural Flavors, Sucralose. INGREDIENTS:Protein Blend (Whey Protein Isolate), Isomalto-Oligosaccharides (Prebiotic Fiber), Water, Almonds, Cocoa Butter, Dried Raspberries, Erythritol. Contains Less Than 2% Of The Following: Sea Salt, Steviol Glycosides (Stevia), Natural Flavors, Sucralose.